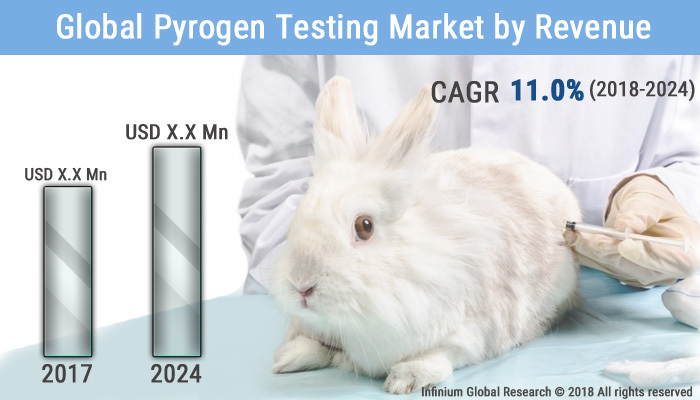 A recent report published by Infinium Global Research on pyrogen testing market provides an in-depth analysis of segments and sub-segments in global as well as regional pyrogen testing market. The study also highlights the impact of drivers, restraints and macro indicators on the global and regional pyrogen testing market over the short term as well as long term. The report is a comprehensive presentation of trends, forecast and dollar values of global pyrogen testing market. According to the report the global pyrogen testing market is projected to grow at a CAGR of 11% over the forecast period of 2018-2024. A thermostable bacterial toxin that persuades immunogenic response when administered parenterally. Pyrogen increases body temperature after releasing or injecting into the human blood. Pyrogen comprises several groups of microbial and non-microbial substances that primarily cause fever. Pyrogens are lipopolysaccharide in nature, lipid part of pyrogen is pyrogenic whereas polysaccharide part increases the solubility. Symptoms of pyrogen include a rise in body temperature, chills, body aches; a rise in arterial blood pressure and cutaneous vasoconstriction are some of the reactions caused in the human body. Pyrogen testing is a procedure that determines the presence of bacterial toxins in biotechnological products, vaccines, and drugs, which influences fever in humans. At the time of drug and vaccine manufacturing process, pyrogen testing is carried out to avoid contamination and to ensure the absence of toxic molecular products. Pharmaceutical companies use pyrogen testing to determine the presence of bacterial toxins in medical and veterinary products. The most powerful and most widely known pyrogens are the endotoxin and lipopolysaccharides, which are cell wall components of gram negative bacteria. The increasing occurrence of numerous diseases has increased the demand of pharmaceutical, biotechnology, and medical devices industry thus driving the growth of pyrogen testing market. In addition, growing R&D in Life Sciences Industry is another factor that will boost the growth of the market. Moreover, government initiatives in rising awareness among the public for health care are likely to augment the growth of the market. On the other hand, strict government regulation is likely to restrain the growth of the market. Furthermore, increasing pharmaceutical outsourcing activities is likely to bring more opportunities to the market. Among the regions, North America is expected to the largest market for pyrogen testing. The presence of the leading pharmaceutical company and well-established guidelines for the pharmaceutical manufacturing processes is likely to drive the growth of pyrogen testing market in this region. In addition, the U.S. holds the largest market share in the North America region. The growth in the Asia-Pacific region is mainly driven by developing countries such as China and India. The leading player is focusing to expand theirs in this region. Furthermore, fast developing healthcare infrastructure in this region is another factor for the growth of the sector in this region. The report on global pyrogen testing market covers segments such as component, test type, and end user. On the basis of component the global pyrogen testing market is categorized into instruments, kits, and reagents. On the basis of test type the global pyrogen testing market is categorized into rabbit pyrogen test (RPT), recombinant factor c assay (RFC), limulus amoebocyte lysate (LAL) test and monocyte activation test (MAT). On the basis of end, user the global pyrogen testing market is categorized into medical device companies, pharmaceutical companies, biotechnology companies, and others. The report provides profiles of the companies in the global pyrogen testing market such as Genscript, Lonza Group, Associates of Cape Cod, Inc., Charles River Laboratories International, Inc., Merck KGaA, Wako Chemicals, Hyglos GmbH, WuXi PharmaTech (Cayman), Inc and Others. The report provides deep insights into demand forecasts, market trends, and micro and macro indicators. In addition, this report provides insights into the factors that are driving and restraining the global pyrogen testing market. Moreover, IGR-Growth Matrix analysis given in the report brings insight into the investment areas that existing or new market players can consider. The report provides insights into the market using analytical tools such as Porter's five forces analysis and DRO analysis of pyrogen testing market. Moreover, the study highlights current market trends and provides forecast from 2018-2024. We also have highlighted future trends in the pyrogen testing market that will impact the demand during the forecast period. Moreover, the competitive analysis given in each regional market brings insight into the market share of the leading players. This report will help manufacturers, suppliers, and distributors of the pyrogen testing market to understand the present and future trends in this market and formulate their strategies accordingly.